The Transportation Safety Board has issued a safety advisory in the wake of last week’s fatal crash of a Hydro One helicopter reminding operators to ensure cargo being stored outside the cabin be securely attached. 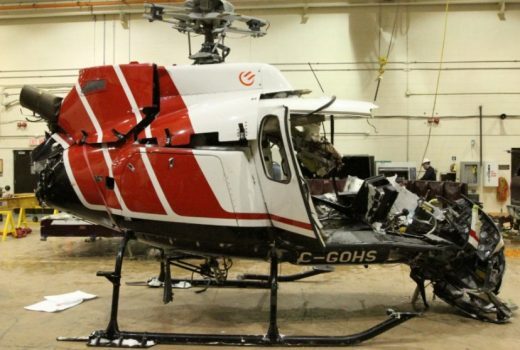 The TSB has concluded that the crash of the AS350, which killed four Hydro One employees, was caused by a tool bag that flew off an exterior platform and hit the tailrotor of the aircraft. The shredded bag with a piece of the tailrotor embedded in it was found 600 metres from the crash site. The TSB also found that the three passengers either fell or jumped out of the helicopter and recommended that all operators ensure that passengers are securely belted into their seats before the aircraft takes off. In addition to the pilot, the helicopter was carrying three linemen who were working on a transmission line near Tweed, Ontario. Hydro One said it’s taking the warnings to heart. “We are pleased that the TSB has been able to release this preliminary information and we will be incorporating today’s safety bulletin into our own review of our operating practices and procedures,” Chief Operating Officer Greg Kiraly said.